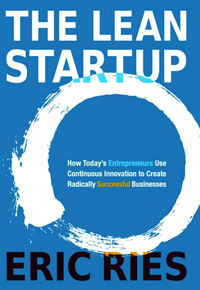 I finally finished reading The Lean Startup. The main gist is that we need to be creating fast feedback looks for products/changes we make, so that we can quickly see what is and isn’t working. It’s a good extension of what to do once you have you minimum-viable product up and running, as it’s easy to fall into the trap of just adding features, without actually adding any value. I especially liked the parts on doing a cohort study of your users. Instead of measuring figures like engagement as a total for a specific time, you would track engagement for people who signed up in January only, then sign ups in February, then March, etc. This gives you a better picture of whether you’re actually improving your service or only appearing to improve because of growing figures. Overall the book wasn’t too bad. I felt that perhaps the first half was a lot more “actionable” and my interest fell off once past the half way point, so I ended up just steaming through after that. Definitely worth reading if you’re in the startup arena though. I’ll be getting another copy soon anyways as I’ll be seeing Eric talk when he comes to London in January.